The original Cradle Forestry mural was painted in 1997 by Barry Nehr while the exhibits were being installed. Ian Wilkinson was able to match up Barry Nehr�s style and added to the Forestry mural in 2016. According to Barry, "Background murals usually include much of the flora and fauna appropriate to the ecosystem being exhibited. These paintings usually draw you in and capture your imagination, helping to transport you into the story that is being told." Throughout his lifetime, artist Barry Nehr brought into our own field of vision the aweinspiring beauty that he saw and appreciated about forests. Barrion Duane Nehr was born and raised in Lancaster, PA. He spent his childhood in and around forests, farms and fields while hunting, fishing and exploring. A love of forests led him to attend the New York State Ranger School, located in the wilds of up-state N.Y. He then pursued a career in forestry where he marked timber, built trails, fought forest fires and learned other forestry-related skills. Although he graduated more than 40 years ago, he went back to offer his time to paint an expansive mural for the school's 100-year anniversary. As a youngster, Barry exhibited a talent for drawings, producing many pencil and pen & ink sketches, always with a preference for wildlife. Barry worked primarily with oils with an impressionistic style, emphasizing color and light. In his early teens, Barry began drawing with pen and ink and the typical subject matter - wildlife and forests. The project that brought him to Georgia kept him here and was the background mural for an exhibit at the visitor's center at Georgia's highest mountain peak at Brasstown Bald depicting historic, natural scenes of Georgia. Barry's work caught the eye of Harry Rossoll, the creator of Smokey the Bear, who then brought Barry into the U.S. Forest Service in Atlanta as his assistant. After Rossoll retired, Barry accepted role of Regional Illustrator. 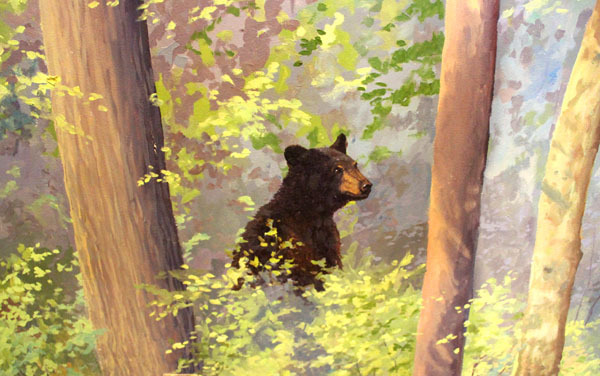 When Barry retired from the U.S. Forest Service in 1989, he continued doing background murals for several exhibit design and fabrication companies. In an unfortunate event, he lost many original paintings in a building fire March 2015 in Savannah. Surviving paintings can be found in galleries on Tybee Island and in Jasper, Ga. His murals can be seen at state and national parks throughout the U.S., and in Georgia at the Brasstown Bald visitor's center, Piedmont National Wildlife Refuge, the Savannah River National Wildlife Refuge, and the Georgia Forestry Commission's mobile environmental classroom, among other locations. He also has written two books for young readers, Deep Forest Mystery, and The Forested Planet, both of which feature exceptional forest paintings.